Archive utility and media viewer. Is there a better alternative to Total Manager? Is Total Manager really the best app in File Management category? Will Total Manager work good on macOS 10.13.4? Total Manager is an all-in-one app to manage loads of files in an efficient way. 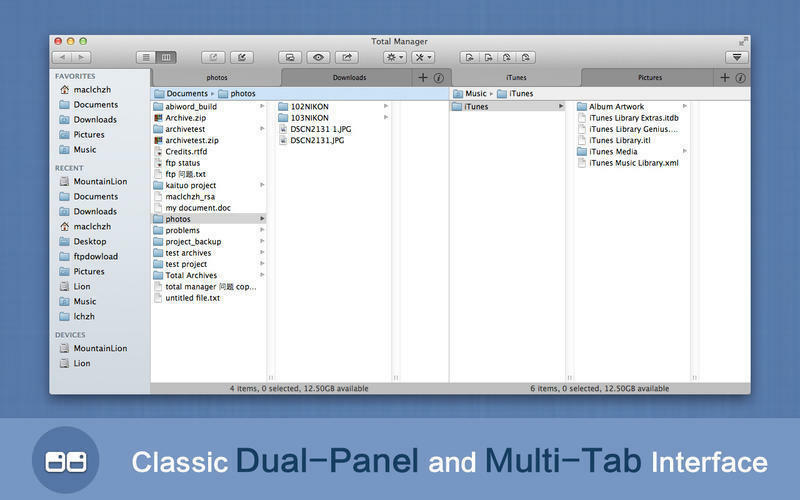 Total Manager is a powerful file manager with a classic double-window and multi-tab interface. It is not only a professional archiving app that can easily compress, extract, and preview almost all archive files such as ZIP, RAR, 7z and more, but also supports viewing images, playing audio and video files, together with basic operation such as copy, move, rename, and delete. Moreover, you can open multiple tabs and browse local directories and archives separately at the same time. In short, it's a great file manager.